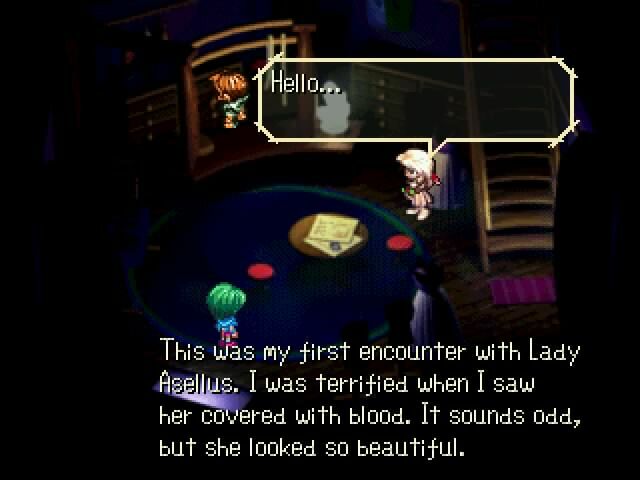 Asellus is one of the seven protagonists in SaGa Frontier (she is the one with the green hair in the image above). Many players suggest she is meant to be read as a lesbian character, though some descriptions suggest the attraction others feel for her stems fromLord Orlogue’s mystic blood, which he used to bring her back to life after running over her with a carriage. Zozma: Because she knew you loved her. Asellus: …Yes, as a sister and friend. Zozma: Didn’t White Rose just tell you to live in freedom? Maybe it’s time for you to come out with it. Deny it all you want, but I’m telling you it’s not healthy. The other character with whom Asellus has a potentially romantic relationship is Gina, who tailors Asellus’s outfits and discusses having a deep attraction to her, an example of which can be seen in the image above. Asellus’s storyline has three possible endings. Her “fully human” ending results in her getting married and having kids. In her “half-mystic” ending, Gina is an old woman Asellus regularly visits with other friends, including White Rose. In her “bad ending,” Asellus becomes a full mystic, takes the place of Lord Orlogue, and marries Gina and several other women. An image of this scene appears below, and all of the endings can be found in this walkthrough. 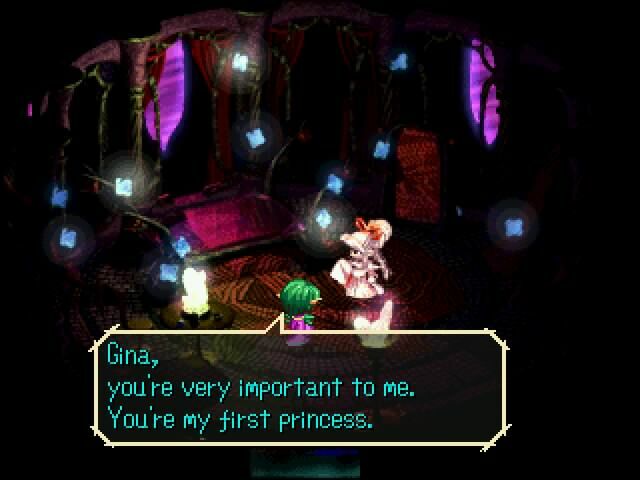 Asellus takes Gina as her princess in the “bad” Mystic ending. This entry was posted in 1990s, Characters, Lesbian, Lesbian (implicit), Playable Character, Queer women on December 12, 2015 by Adrienne Shaw.